EXCITING UPDATE! PRE- ORDER/EARLY RELEASE FOR MAC VIVA GLAM NICKI LIPSTICK! Just received this exciting email from MAC Cosmetics in my inbox a moment ago & HAD to jump on and share with you! Labels: beauty , bentleyblonde "mac viva glam nicki" "viva glam nicki lipstick" mac cosmetics pre order release pink lipsticks swatches "pink friday" "mac nicki" "nicki minaj"
Nicki and Ricky Team up for MAC Viva Glam 2012 ! 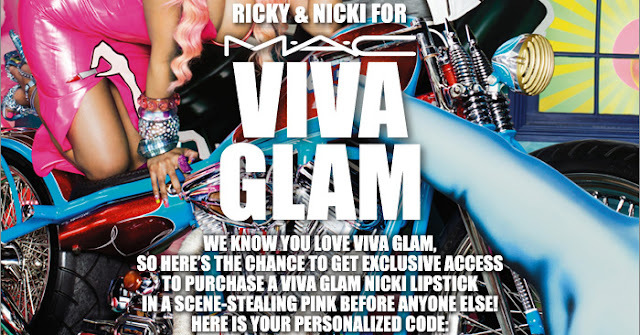 Nicki Minaj and Ricky Martin have teamed up for MAC's 2012 Viva Glam campaign! 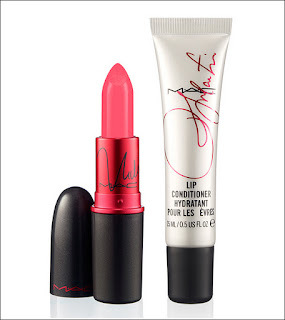 I absolutely LOVE everything Viva Glam, especially because all monies raised through the sale of these products go directly to the MAC AIDS Fund, which helps support people living with HIV/AIDS. Who doesnt love supporting a worthy cause while sporting their favorite lipstick shade?! Ricky Martin's addition to the collaboration is a clear lip conditioner. Not sure how much I really need anymore glosses :/ Particularly clear ones, so may end up skipping on this one. Viva Glam Nicki and Ricky will be available in the US in store/online on February 15, 2012 and Internationally, in March 2012. Will YOU be picking up either of these products?